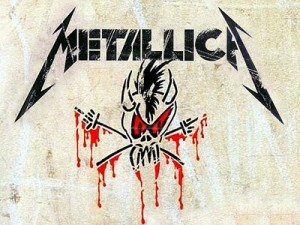 Metallica is an American heavy metal band formed in Los Angeles, California. Metallica was formed in 1981 when vocalist / guitarist James Hetfield responded to an advertisement posted by drummer Lars Ulrich in a local newspaper. The band’s current line-up comprises founding members Hetfield and Ulrich, longtime lead guitarist Kirk Hammett and bassist Robert Trujillo. Lead guitarist Dave Mustaine and bassists Ron McGovney, Cliff Burton and Jason Newsted are former members of the band. Metallica collaborated over a long period with producer Bob Rock, who produced all of the band’s albums from 1990 to 2003 and served as a temporary bassist between the departure of Newsted and the hiring of Trujillo. The band’s fast tempos, instrumentals, and aggressive musicianship placed them as one of the founding “big four” bands of thrash metal, alongside Anthrax, Megadeth, and Slayer. The band earned a growing fan base in the underground music community and won critical acclaim with its first four albums; the third album Master of Puppets (1986) was described as one of the most influential and heaviest thrash metal albums. 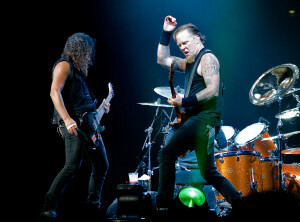 Metallica achieved substantial commercial success with its eponymous fifth album—also known as The Black Album—which debuted at number one on the Billboard 200. With this release the band expanded its musical direction, resulting in an album that appealed to a more mainstream audience. In 2000, Metallica was among a number of artists who filed a lawsuit against Napster for sharing the band’s copyright-protected material for free without consent from any band member. A settlement was reached and Napster became a pay-to-use service. Despite reaching number one on the Billboard 200, the release of St. Anger (2003) alienated many fans with the exclusion of guitar solos and the “steel-sounding” snare drum. A film titled ‘Some Kind of Monster’ documented the recording of St. Anger and the tensions within the band during that time. In 2009, Metallica was inducted into the ‘Rock and Roll Hall of Fame’. 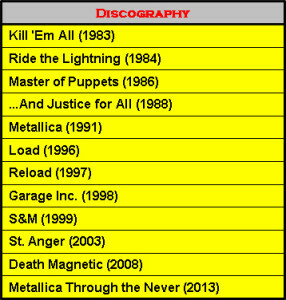 Metallica has released nine studio albums, four live albums, five extended plays, 26 music videos, and 37 singles. The band has won eight Grammy Awards and five of its albums have consecutively debuted at number one on the Billboard 200. The band’s eponymous 1991 album has sold over 16 million copies in the United States, making it the best-selling album of the SoundScan era. Metallica ranks as one of the most commercially successful bands of all time, having sold over 110 million records worldwide. Metallica has been listed as one of the greatest artists of all time by many magazines, including Rolling Stone, which ranked them 61st on its list of The 100 Greatest Artists of All Time. 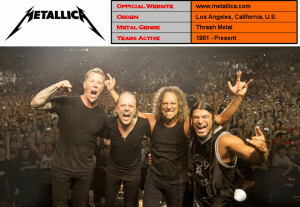 As of December 2012, Metallica is the third best-selling music artist since Nielsen SoundScan began tracking sales in 1991, selling a total of 54.26 million albums in the U.S. In 2012, Metallica formed the independent record label Blackened Recordings and took full ownership of its albums and videos. As of 2015, the band is in production of its tenth studio album, slated to be released in 2016. Metallica has become one of the most influential heavy metal bands of all time, and is credited as one of the “big four” of thrash metal, along with Slayer, Anthrax, and Megadeth. The band has sold more than 110 million records worldwide, including an RIAA-certified 66 million and Nielsen SoundScan-reported 53,642,000 in the U.S., making Metallica one of the most commercially successful bands of all time. The writers of The Rolling Stone Encyclopedia of Rock & Roll said Metallica gave heavy metal “a much-needed charge”. Stephen Thomas Erlewine and Greg Prato of Allmusic said Metallica “expanded the limits of thrash, using speed and volume not for their own sake, but to enhance their intricately structured compositions”, and called the band “easily the best, most influential heavy metal band of the ’80s, responsible for bringing the music back to Earth”. MTV ranked Metallica the third “Greatest Heavy Metal Band in History”, was listed fifth on VH1’s 100 Greatest Artists of Hard Rock, and the band was number one on VH1’s 20 Greatest Metal Bands list. Rolling Stone placed the band 61st on its list of “The 100 Greatest Artists of All Time”; its albums Master of Puppets and Metallica were ranked at numbers 167 and 252 respectively on the magazine’s list of The 500 Greatest Albums of All Time. Master of Puppets was named in Q Magazine’s “50 Heaviest Albums of All Time”, and was ranked number one on IGN’s “Top 25 Metal Albums”, and number one on Metal-rules.com’s “Top 100 Heavy Metal Albums” list. “Enter Sandman” was ranked number 399 on Rolling Stone’s “500 Greatest Songs of All Time”. On March 7, 1999, Metallica was inducted into the San Francisco Walk of Fame. The mayor of San Francisco, Willie Brown, proclaimed the day “Official Metallica Day”. The band was awarded the MTV Icon award in 2003, and a concert paying tribute to the band with artists performing its songs was held. Performances included Sum 41 and a medley of “For Whom the Bell Tolls”, “Enter Sandman”, and “Master of Puppets”. Staind covered “Nothing Else Matters”, Avril Lavigne played “Fuel”, hip-hop artist Snoop Dogg performed “Sad but True”, Korn played “One”, and Limp Bizkit performed “Welcome Home (Sanitarium)”.